This cute little guy, the Carolina Chickadee, was a lot more difficult to photograph than I expected. The biggest challenge was that he doesn’t stay in one place more than a split second, and when he does, he’s doing acrobats. He seems to love to swing upside down from a small branch, while eating. I swear he plays peek a boo with the camera sometimes! 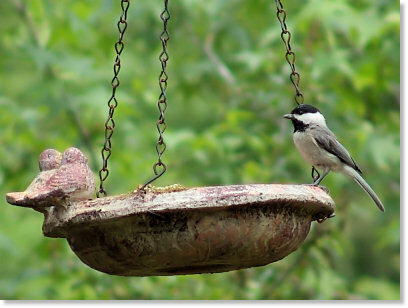 Because the Carolina Chickadee is so small (4-5 inches) I had to get a bit closer to him than he was comfortable with me being. Since the best shots were often just outside the zoom range of my lens, it meant getting him used to me being around, a few steps at a time. I started this process by sitting quietly on the ground, very near to the tree, and reading for 30 minutes or so at a time. This seemed to help him get used to me, and also expecting small amounts of movement. After a few days had passed, I noticed that he would watch me now and then, almost as if he was curious what I was doing. As long as I didn’t make any sudden movements, he didn’t fly off, but he was still a nonstop moving target. This is probably right about the time that I reminded myself that I have to begin seriously thinking about putting a better camera near the top of my priority list of things that I want to buy this summer. I was still certain though that if I was patient enough, there had to be a way to get a few halfway decent shots of this little songbird. By spending more time watching him, I began realized that he was far more predictable than I thought initially. 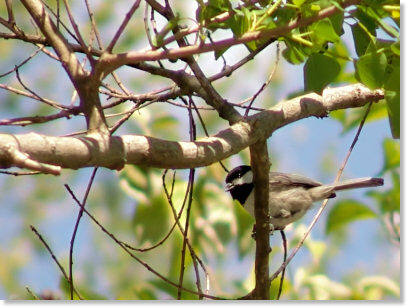 During the early morning, and about an hour before dark, this particular Carolina Chickadee spends more time eating, and less time singing and playing. He also has a predictable pattern of which branches he chooses to hang out at, even working his way up and down, one branch at time. Because I was now able to more easily predict his behavior I knew which areas he would likely stay a bit long and I had the camera ready for where I knew he would go next. This kept me from continually trying to following him and risking the movement scaring him away. Finally, I ended up with a couple of photographs that I like, but I haven’t stopped watching his playful antics in hopes of one day getting an absolutely perfect shot. 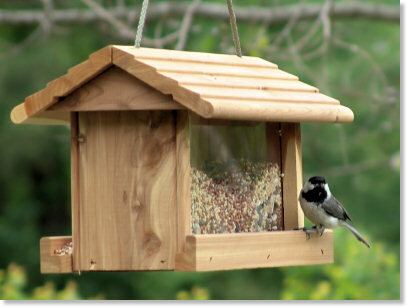 If I do, I will be back to add a few more Carolina Chickadee photo tips.